So Lonely in Gorgeous: Wishing you a happy holiday and a wonderful manicure! Wishing you a happy holiday and a wonderful manicure! Happy Holidays every one! Here's what I'll be wearing on my nails for tonight's Holiday party. 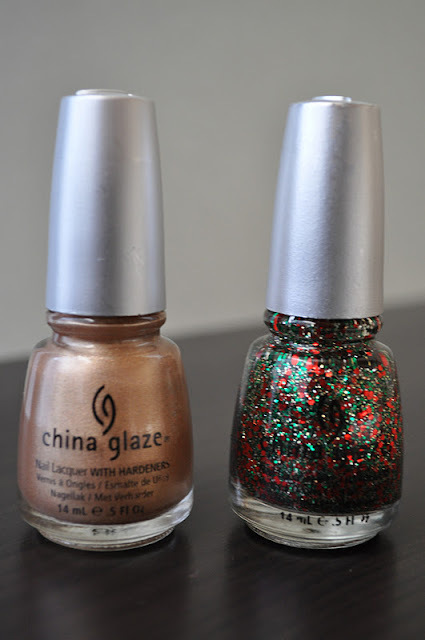 China Glaze's Jingle Bells and Party Hearty. Jingle Bells is a golden champagne with micro flecks of gold shimmer. Party Hearty is a gold, red and green chunky glitter polish. Both of these shades were part of last years ' Tis the Season' Collection. Unfortunately, I wasn't able to capture how lovely these two polishes look together; reminds me of Holiday gift wrapping paper. I am loving this glitter polish! It looks so festive! How has the Holiday season been treating you? I am a little upset its over... Seemed to have passed by too quickly... I wish I didn't have to wait a whole year to do it again! haha how was your holiday? Unfortunately, Christmas isn't really celebrated over here :( you my holiday was great, actually going to L.A. tomorrow :) man, I'm going to burn a whole in my wallet!!! I hope you have a great time! hehe...I think the biggest problem will be fitting everything into your luggage!